Spaces for Change’s executive director, Victoria Ohaeri speaks on concerning provisions in Nigeria’s oil reform bill, the Petroleum Industry Bill affecting the environment, community participation, security and natural resource governance. 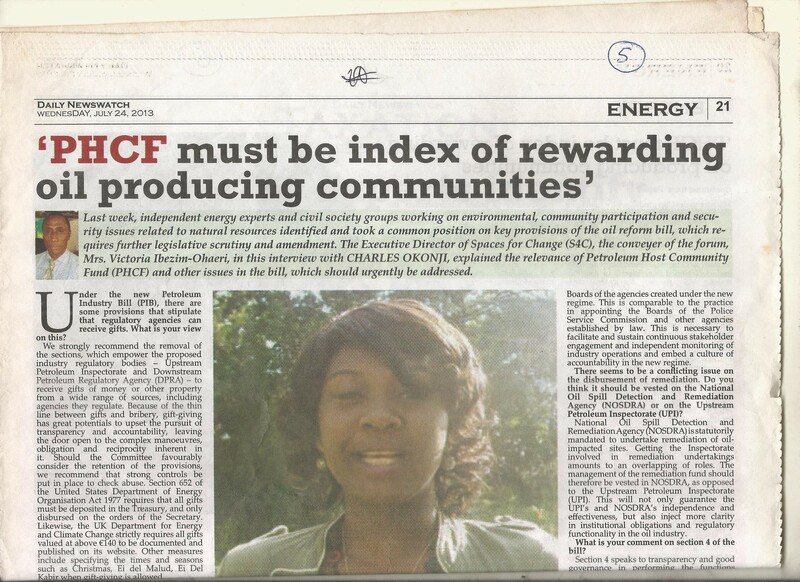 Mrs. Victoria Ibezim-Ohaeri, in this interview with CHARLES OKONJI of Daily NewsWatch, explained the relevance of Petroleum Host Community Fund (PHCF) and other issues in the bill, which should urgently be addressed. Under the new petroleum Industry Bill (PIB), there are some provisions that stipulate that regulatory agencies can receive gifts. What is your view on this? We strongly recommend the removal of the sections, which empower the proposed industry regulatory, bodies-Upstream Petroleum Inspectorate and Downstream Petroleum Regulatory Agency (DPRA)-to receive gifts of money or other property from a wide range of sources, including agencies they regulate. Because of the thin line between gifts and bribery, gift-giving has great potentials to upset the pursuit of transparency and accountability, leaving the door open to the complex maneuvers, obligation and reciprocity inherent in it. Should the committee favorably consider the retention of the provisions, we recommend that strong controls be put in place to check abuse. Section 652 of the United State Department of Energy organization Act 1977 requires that all gifts must be deposited In the Treasury, and only disbursed on the orders of the Secretary. Likewise, the UK Department of Energy and Climate Change strictly require all gifts values at above 140 Euro to be documented and published on website. Other measures include specifying the times and seasons such as Christmas, Ei del Kabir when gift-giving is allowed. The same bill included gifts as a source of funding for the regulatory agencies. Do you think it is proper? Gifts cannot be source of funding for the regulatory agencies. We recommend that this section be expunged from the bill for the same reasons, we have stated earlier. Regulatory agencies should be adequately funded and allowed to operate optimally. Some stakeholders believe that the Minister of Petroleum Resources is being given an overwhelming power under the bill. How do you react to this? We take the view that the powers conferred on the Minister in the PIB are quite excessive. Uncontrolled decision-making power is often prone to misuse and abuse, mainly because it is impossible to see into g how decisions are arrived at and also disguises accountability. The minister will determine the administrative structure of the Petroleum Host Community (PHC) and also serve as the chairman of the boards of the Petroleum Trust Development Fund (PTDF) and the Petroleum Equalization Fund (PEF). The minister is also empowered to make regulation regarding major fiscal terms such as fees/bonuses, royalties and the terms of production sharing contracts (PSCs). In particular, the Minister’s powers to appoint or recommend those to be appointed as Board members of most agencies to be created under the Act, and the power to make regulations at a future date, leave room for abuse and political interference. Transferring some of these roles to the National Assembly and the Federal Executive Council are examples of specific controls that could enhance transparency and accountability. Secondly, the effective administration of the petroleum industry is anchored on expertise and technical knowledge of industry operations, which the petroleum minister, who is often a political appointee, may be incapable of undertaking. This makes the concentration of powers on the Minister a very unsafe practice for improving industry operations. Not only that, ascribing too many powers to one office or official creates vulnerabilities by heightening the likelihood of abuse of authority, rent-seeking and conflicts of interest. What is your view on the President’s discretionary powers to award licenses and leases? The President’s discretionary powers to award licenses and leases should be expunged from the Bill to avoid the kind of abuse that took place during the past regimes. Leases and awards must be subjected to transparent and competitive bidding processes and the outcomes of such bids respected. The absoluteness of the President’s power diminishes the transparency objectives of the Bill, in that it precludes both independent and public scrutiny of the character of such awards and their beneficiaries, thereby rendering oil and gas licensing prone to political patronage. What other sections of the bill do you find disturbing? Another disturbing clause is Section 118 (5) which dishes out collective punishment on host communities where obstruction or damage to any petroleum facilities occurs as a result of vandalism, sabotage or other civil unrest. The costs of repairing such damaged installations will be deducted from the Fund. The Bill failed to take into account that persons responsible for an act of vandalism or sabotage may not necessarily come from the community where the facility is located. Also, the sophistication, complexity and intensity with which organized crimes (e.g. pipeline vandalism and theft of petroleum products) are perpetrated require very skilled security interventions often absent within the host communities. The implication of subsection 118(5) is that the Federal government appears to be outsourcing of oil facilities to “host communities”. How do you think the boards of the proposed agencies can perform effectively? Key stakeholders in the oil and gas sector particularly the civil society and host communities should be represented in the boards of the agencies created under the new regime. This is comparable to the practice in appointing the boards of the Police Service Commission and other agencies established by the law. This is necessary to facilitate and sustain continuous stakeholder engagement and independent monitoring of industry operations and embed a culture of accountability in the new regime. There seems to be conflicting issues on the disbursement of remediation. Do you think it should be vested on the National Oil Spill Detection and Remediation Agency (NOSDRA) or on the Upstream Petroleum Inspectorate (UPI)? National Oil Spill Detection and Remediation Agency (NOSDRA) is statutorily mandated to undertake remediation of oil impacted sites. Getting the Inspectorate involved in the remediation undertakings amount to an overlapping of roles. The management of the remediation fund should therefore be vested in NOSDRA, as opposed to the Upstream Petroleum Inspectorate (UPI). This will not only guarantee the UPI’s and NOSDRA’s independence and effectiveness, but also injects more clarity in institutional obligations and regulatory functionality in the oil industry. What is your comment on section 4 of the bill? Section 4 speaks to transparency and good governance in performing the functions and achieving the objectives of the PIB. In this regard, all companies and agencies are bound by the Nigerian Extractive Industries Transparency Initiative (NEITI) Act. This should be slightly reworded. The transparency stipulations should also cover “institutions”, companies and agencies and should not be limited to just companies and agencies. 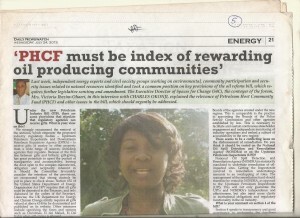 There have been a lot of controversies over the Petroleum Host Community Fund (PHCF). The northerners are kicking against it while the southerners are agitating for it. What is your view? This Petroleum Host Community Fund must be retained in the bill as it is only index of reward that goes to the oil producing communities. This fund is set aside for any community in any part of the country where oil is extracted and produced. This means that current river basins across the country with prospects of oil finds are potential beneficiaries of the PHCF. It is different from other initiatives such as the Niger Delta Development Commission (NDDC) in that it is not limited by geographic location. Therefore the PHCF represents an intergenerational mechanism for addressing the environmental damage and infrastructure deficit in areas where oil is extracted. Some people are saying that there should be a proper definition of host community. Do you think the bill did not give adequate definition of host community? Several provisions of the PIB make reference to host communities, especially 116-118, establishing the Petroleum Host Community Find (PHC) Fund. However, there is no clear definition of the highly loaded term, “host community”. The interpretative section of the Bill (S.362) provides little or no real guidance on the definition of “host communities”, nor does it indicate such groups or settlements qualify for the status and the criteria for that section. We recommend the following definition: A host community is a community where the wellhead is located, and hydrocarbon physically prospected and mined from there. The creation of the remediation fund is S.203 of the Bill adequately caters for communities impacted by petroleum operations and products. How do you think the PHCF should be managed? The bill is silent on how the fund will be administered, but empowers the Petroleum Minister to develop guidelines for managing the funds. Most of the community clashes in oil producing communities in the Niger Delta region are linked to funds given to communities either by the government or oil companies. Therefore, postponing the establishment of an administrative structure for the Host Community Fund may be potentially making the pave way for internal strife among communities. Creating a governance structure for the PHC Fund should not be left in the hands of the Petroleum Minister alone is proposed under the section 118(6) of the PIB. The national Assembly is urged to consider the creation of a community-based fund management structure, called the Community Development Board, t manage the PHC Fund. The Proposed Community Development Board will serve as an independent body, without prescriptive interference from governmental agencies, state governors and traditional institutions, whose members are appointed for a fixed tenure by different interest groups-women, youth, traditional rulers, elders’ council-within oil producing communities. Neither does it clarify the procedures by which the host communities can verify the actual sums that accrue to them from the Fund. An information disclosure policy regarding the contributions into the fund as well the disbursement should be put in place. Some decisions of the PIB required that certain industry operations should be published. In what form should it take? We recommend for the insertion of the word “digitized” as part of the ways of publishing the statutory registers and publications about industry operations. We submit that the digitization of data regarding petroleum operations will facilitate information dissemination and expand the reach to wider audiences. Digitizing data will help tap into the great potential the media offers to present and disseminate information with unprecedented power and speed. Except for specified categories where confidentiality is required, an information disclosure policy outlining the procedure for obtaining types of information is needed to give full effect to this provision. Consistent with a global perspective of transparency in public administration, the policy will also stipulate how and when the Inspectorate and the Agency will respond to requests for access made to it by the media and the public. Such policy will adhere to the limits prescribed by the Freedom of Information Act. How do you think there should be adequate environmental quality management? Beyond the requirement for oil companies to develop an awareness plan for informing their employees of any environmental risks which may result from their work, section200 failed to create a corresponding obligation for operators to outline how they will warn local communities about the potential social, economic and health impacts of their activities. The increasing oil exploratory activities in Nigeria means that now more than ever, persons and communities likely to be impacted need to be prepared and informed on the impacts of oil prospecting and mining. Communities need to understand the contents of the Environmental Management Plans (EMPs) of various operations working in their communities, and how to use these stardands to demand protection against environment hazards. In addition, section 200 does not establish mechanisms or procedures through which impacted persons and communities may access the EMPs, or information regarding the detailed strategies for impact prevention, minimization, and mitigation. We recommend the creation of strict legal obligation on oil companies to involve oil bearing communities in the design and implementation of the EMPs is very vital, this obligation should be supported by robust legal provisions requiring licensed operators, state and local governments to undertake awareness creation on the EMPs and the hazardous chemicals used in petroleum operations. Are you comfortable with the provision on gas flaring? Section 275 prohibits gas from being flared- in any oil and gas production operation, block or field, onshore or offshore, or gas facility such as, processing or treatment plant-after a date (the flare-out date) to be prescribed by the Minister, except where the minister permits. The provisions relating to gas flares seem to give by one hand and take from the other hand. After banning gas flaring, it creates room for exceptions to be granted by the minister. That is not effectively different from what is happening under the current regime. It turns gas flaring into discretionary permit-granting. This should be expunged from the bill. Encourage gas usage: We submit that deadlines alone cannot stop gas flaring. The timelines set should be realistic and recognize the capital intensive nature of gas infrastructure. We recommend the use of policy to encourage investment in gas discovery, production and local usage. Just like countries that have used policy to encourage the use of gas domestically such as Qatar, Indonesia, Russia, Brazil etc., the Nigerian Government should take similar steps to encourage the domestication and local usage of gas, to facilitate the transition from the use of firewood, kerosene and other non-renewable energies to gas. Furthermore, it is not just enough to require oil companies to install measurement equipment for measuring the amount of gas being flared as contained in section 201. This must be matched with a corresponding capacity of regulatory agencies to independently verify, track and measure gas volumes produced and flared. Flaring penalties: there no details on penalty fees and no specific timelines for a total flare-out date in PIB. The penalty fees and flare-out dates are to be determined by the minister from time to time by regulation. The complete range of sanctions and fines for regulatory non-compliance must be clearly spelt out for certain environmental offences. Legislative clarity is needed to help businesses stay on the right side of the law, whilst contributing to a better environment for all. Available sanctions include fixed and variable monetary penalties and notices to indicate compliance, restoration and freezing of work. What do you think should be the obligations of licensee, lessee and contractors in the bill? Provisions requiring operators to hold due consultations to identify the needs of the community people is imperative, and should be recognized as part of the obligations of licensee, lessee and contractors set out in S.292 of the PIB. Free, prior and informed consent of oil producing communities must be sought and obtained by oil companies and licensed operators before the commencement of oil production. We strongly recommend that provisions that obligate oil companies or government agencies to consult and obtain prior consent of local communities, as well as establish adequate information disclosure measures for communicating the impacts of oil operations to communities, particularly data on fisheries, agriculture, health and livelihoods should be included in the PIB. What is your comment on the domestic gas supply obligation (DGSO)? The DGSO makes the distinction between gas fields to the involved and the ratio of production to be allocated to the domestic market. This can be a potential source of problem since gas processes in the domestic market in Nigeria are very low and marginal fields or high cost deep-water field. There should be an optimized strategy to incentivize deep-water fields to supply the domestic market and possibly include small/marginal fields from the DGSO. In countries such as Egypt and Indonesia, a combination of domestic gas price have resulted in lower exploration activity and had negative effect on investment for further gas development. An optimized domestic gas supply strategy will ensure adequate supply to the domestic gas market as well as continuous investment in gas exploration and development. Sections 295 talked about utilization of good oilfield practices. How would you explain this? The phrase, “good oil field practices” used frequently in the Bill lacks a clear definition or setoff guidelines to aid uniform comprehension. The actual practices of international oil companies such as community development assistance, cleanup standards, waste disposal methods and so forth vary from company to company and across jurisdictions. Thus determining which practices are or should be generally accepted as “best practices” is particularly difficult in reality and could susceptible to the subjective interpretations of vested parties. Such ambiguity could provide considerable legal uncertainty especially in a country like Nigeria with a confounding judicial arena where achieving corporate accountability is an uphill struggle. Therefore, injecting some specificity into the meaning of “good oil Field practices” would significantly provide guidance on minimal standards of performance expected from oil companies. For instance, the requirements for companies to use products that comply with AP1, ISO and IEC standards is an example of such specific description of “good practice”. Are you comfortable with the provisions on the compensation for environmental damage, destruction of venerated justice? The process for the determination of compensation sums for trees and venerated objects destroyed during petroleum operations, including disturbances on the surface of the land outlined in S.198, 199 and 296 of the bill should be clearly outlined, recognizing landowners, female headed households and communal landholdings. Considering the historical relationships in which local residents and their representatives have felt tokenized, it is critical to outline the procedures and processes for engaging affected persons/communities in culturally appropriate ways. Secondly, there is no provision for independent valuation. Inadequate compensation terms and flawed negotiation processes are at the root of glowing hostilities between oil companies and their host communities. Finally the bill does not provide any localized complaint procedures or mechanisms through which affected persons and communities may complain about their losses or object to unfavorable compensation terms. We recommend that there should be criteria for determining what is ‘fair and adequate’ compensation and the processes for consulting affected persons should be clearly spelt out. Also, legislative recognition and protection of the rights of women and female-headed households should participate and benefit directly from compensation schemes is highly desirable. There should be grievance procedure for registering compensation related grievances at the inspectorate needs to be specified. Do you share the view that Inspectorate should set up Special Investigative Unit? We strongly recommend that section41 be deleted from the bill. Under that section ,the Inspectorate is empowered to establish a Special Investigative Unit (SIU) with the mandate to investigate violations of the Act, and to keep surveillance on oil and gas installations (S.41). it is instructive to note that SIU’s functions as stipulated in the PIB overlap with the statutory responsibilities of certain agencies such as National Oil Spills Detection and Response Agency (NOSDRA), the Joint Task Force and the Nigerian Security and Civil Defense Corps (NSCDC). In the same vein, two ex-militants were recently awarded marine contracts to carry out similar surveillance activities. UNEP found that overlapping authorities and responsibilities between ministries and a lack of resources within key agencies has serious implications for environmental management on the ground, including enforcement.